Anne Remmer Thompson. "The Juror`s Perspective"
​This evening's presentation will be about gaining a better understanding of the juror's process and should provide helpful feedback for anyone that is submitting works for a juried show. Members are invited to bring in 1-2 pieces of their work for the evening. Anne states "I will give a preamble about jurying in general, and about what jurors will be searching for. I will then illustrate my points with a friendly and upbeat critique of the work that your members bring in. I promise to be very gentle with this. I will use 2 or 3 pieces for each talking point"
ANNE REMMER THOMPSON, born and brought up in the Glebe in Ottawa, is a watercolour and acrylic painter, and teacher. Her simple, peaceful style reflects tranquil beauty. In 1999, she was elected as a member to the prestigious Canadian Society of Painters in Watercolour (CSPWC) and held the post of Regional Director for Ottawa and Eastern Ontario for several years. She was also on the jury for new members from across the country for 2 years. Currently, Anne is co-chair of Art Lending of Ottawa, and Jurying Coordinator for the Kanata Civic Art Gallery. She is a Past President of the Ottawa Watercolour Society, of which she is a Fellow, and now Executive Advisor; and a Past President of the Nepean Fine Arts League. Anne is called upon annually to critique and jury for the art associations and municipal galleries of Ottawa and Eastern Ontario. Having received wide recognition in Ottawa and Eastern Ontario, Anne has won numerous awards and prizes. (Recently, 1st. prize in the 75th. Juried Show of OWS.) Her several solo shows in local galleries have been most successful. She has participated in many 2 and 3 person shows in Ottawa and Toronto. Gallery group shows have been continuous. 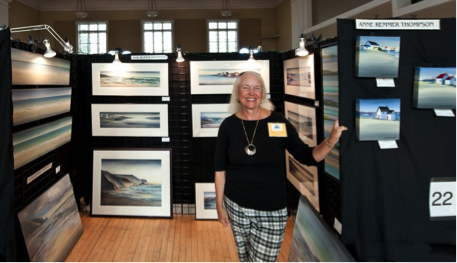 Anne exhibits annually at the New Art Festival, the Glebe Fine Arts Show, and the Kanata Civic Art Gallery amongst others. She took part in the Rideau Valley Art Festival for its entire existence, as well as Ottawa Art Expo. Her paintings are in the permanent collection of the corporation of the City of Ottawa: the City of Gatineau: the Family Care Workers of Ontario, and in hundreds of public and private collection throughout Canada, USA, and Europe. See who spoke at ARTiculate in the past.